Jeff Hodgins has a tiny kitchen with little storage space, an ice chest instead of a refrigerator and freezer, and no electricity. He has to buy food supplies for 26 people to last six days with no in-between access to a store. He cooks three meals a day plus snacks for these folks. Did we mention he does all of his cooking on a wood stove? 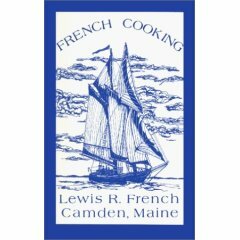 Hodgins is the full-time chef on the Lewis R. French, one of 13 tall ships in the Maine Windjammer Association. A sometime chef and full-time disc jockey in Baltimore, Hodgins has others running his business while he sails with the French during the sailing season. "I guess I should have seen the galley before I signed up," he jokes about the tiny size of the galley, a triangular space in the bow of the schooner estimated to be about 15 by 15 feet, with an actual working space of 4 by 6 feet. The French is the oldest windjammer in the Maine Windjammer fleet and a national Historic Landmark. Owned by Captain Dan and Kathy Pease, it is 64 feet long and carries 22 passengers and four crew members, one of them Hodgins. The recipes that he uses are Kathy's, and her preserves and canned pickles are served at every meal. "The recipes are in this folder," says Hodgins, holding up a blue binder marked "Bible." Meals are served family style. Hodgins' compact galley (that's what a kitchen is called on a schooner) is below deck, like all of the cabins. Hodgins does all the cooking down there; in inclement weather, passengers and crew eat there. It is a tight squeeze, but all 22 passengers and the four crew can eat in the galley in one seating, although Hodgins waits until everyone else has eaten before he starts his own meal. In better weather, meals are served on the deck. The 30-year-old Hodgins grew up in Baltimore and started culinary school after high school. "I went for about six months, then decided I could learn just as much for a whole lot less money by working in restaurants," he says. He worked in several and also started his own disc jockey business. "I used to go to bed at 4 a.m. -- now, that's when I get up," he says. When Hodgins heard about the French last winter from another crew member, he decided to try a season as the chef. After he was hired, he helped prepare the schooner to sail in early May. The season began Memorial Day weekend. Three- and six-day cruises are offered though mid-October, and the crew has one day off between sailings. Hodgins and the other two crew members live full time on the schooner. The French is harbored in Camden, Maine, which is where the Pease family lives. Dan Pease captains every cruise. Before each sail, Hodgins goes to the local grocery store in Camden and buys enough food for that cruise. "I'm usually pushing three or four carts around the store," says Hodgins. Storage is extremely limited, and food is packed into small spaces in the walls of the galley and under the seats. Crew housing is equally tight. The other two crew members sleep in bunks built into the galley walls. Hodgins' own bunk is in a cubby, neatly tucked in between two other guest cabins. He has to duck to get into his tiny room without windows. "I repeat, maybe I should have seen the ship before I signed on," he says. The ice chest that serves as the refrigerator and freezer is on deck, along with an ice chest where guests can store their own beverages and snacks. With Hodgins' cooking, however, there is little need for snacks. He arises and starts baking muffins or bread from scratch. At 7 a.m., fresh coffee and the muffins are served, followed by a full-course breakfast at 9 a.m. A typical breakfast is blueberry pancakes and sausage or "Lewis R. French" toast with bacon, juice and coffee. Lunch is a salad, soup and dessert, dinner a full meal with meat, starch, vegetables and more homemade breads. The afternoon snack might consist of crackers and cheese, or freshly made salsa, chips and fruit. Hodgins also has to wash dishes in the tiny sink in the galley. Guests usually pitch in to help. Because of the limited space, dishes are limited as well. At lunch, each guest uses one bowl for both the salad and soup. The food is so good, many guests spend time in the galley copying recipes from the "Bible." "A lot of the recipes are very popular, but the corn bread is my most frequently requested one," said Kathy Pease, "I hope to have a cookbook some day." She has developed the recipes, adapting some from other sources so that each one serves a full complement of hungry guests and crew. As in restaurants, Hodgins must discard foods such as breads that aren't eaten at a meal. During each cruise, he gets one night off from cooking -- a lobster bake on one of the islands when guests help cook the food. Cleanup is easy because paper plates and cups are used, even for the wine. Even on lobster night, Hodgins is still working. "I need to clean the leftover lobsters for the quiche tomorrow," he said, "This is a 15-hour-a-day job." Preheat oven to 400 degrees. Combine dry ingredients in medium mixing bowl. In large bowl, mix eggs and brown sugar until light and fluffy. Add buttermilk and mix well. Add dry mixture, mix gently. Melt butter in small saucepan. Dip paper towel into butter and thoroughly coat preheated 12-inch cast-iron frying pan. Add the rest of the butter to the corn bread mix, blending until just mixed. Pour the batter into frying pan and bake for 30 to 35 minutes until golden brown. Heat butter in soup pot and saute onion until tender and transparent. Stir in pumpkin, broth, ginger and nutmeg. Blend well and bring to a boil. Reduce heat (move to cooler section of stove). About 1/2 hour before serving, add brandy and milk, and heat through. Do not let boil. Serve with croutons. This soup is thin. Serves 6 to 8. Saute onions and garlic in butter. Add jam and bourbon; mix well. Place the chicken in a lasagne pan and smother with sauteed mixture. Cover with foil and bake about 35 minutes in a 350-degree oven. Serves 20 or more. Heat oven to 350 degrees. Place all ingredients except chocolate chips into a large bowl, work together until smooth. Add chocolate chips and stir just enough to incorporate. Press dough evenly into two greased pans, 13 by 9 inches. Score lightly with knife into squares. Perforate with fork tines so bars will cut nicely when baked and cooled. Bake in preheated oven for 35 minutes until set and just turning golden brown. Let cool a few minutes and retrace scored lines. Cool completely in pans before cutting. Serves a full boat (makes two brownie pans full). These freeze well. Note: We used regular-size, milk chocolate chips.